Our route parallels Lake Michigan through Chicago and the north shore Chicago suburbs and is almost entirely flat, following fully paved and signed bike paths and trails about 75% of the way. When it does not follow paths, the route primarily follows low traveled residential and secondary roads. Participants from the Chicago area will be able to get a great day of cycling close to home! Click Here for more information about the types of roads and bike paths the route will follow. Click Here for more information about our riding policies and procedures. There are four possible route options that you can ride. This route is the basis for the event. You will start your ride right over the Illinois/Indiana border in Hammond and finish your ride in Kenosha, riding through 3 states in one day. In order to complete a century, you will ride a loop out of the ending location in Kenosha to add on enough miles in order to ride over 100 miles. It will not matter which specific route segments or options you ride from Hammond to Kenosha in order to complete the century. For this route, you will start the ride in Hammond but end in Waukegan, IL. After you arrive in Waukegan you can then take the Metra train back with your bike to Chicago or any Metra station in between. This ride is perfect for riders who do not want to ride the full distance from Hammond to Kenosha or for riders who want to depart the ride early. Click Here for more information about taking the Metra train from Waukegan. If you want to complete a century ride but do not want to wait at the end in Kenosha for our return transportation service, this route is the one for you! After you arrive at the end in Kenosha, you will turn around and ride the route back to rest stop 4 in Waukegan. The event will start at Wolf Lake Memorial Park in Hammond. The park is in Indiana on the eastern shore of Wolf Lake, which the Illinois/Indiana border passes directly through. The route begins by following a brand new bike path on the shores of Wolf Lake immediately out of the starting location and part of the path includes a brand new bridge over Wolf Lake! From there, you will ride directly along the Illinois/Indiana state line for about 3/4 of a mile to the Indiana state sign - make sure to stop and get a picture! After you head west from the Illinois/Indiana state line you will enter the city of Chicago and ride along the Burnham Greenway Trail which is a rails to trails bike path that proceeds up through quite a bit of Chicago's south side. From there you will ride through Calumet Park and onto the bike path along the brand new "New Lake Shore Drive" which goes through 600 acres that are currently being redeveloped that once housed U.S. Steel's South Works plant. You will then continue to bike through Chicago's south side passing by Rainbow Park. At 71st Street, Chicago's world famous Lakefront Path begins and you will bike on the Lakefront Path directly along Lake Michigan. One of the most amazing things you will ever see is when you catch your first view of the Chicago's awe inspiring skyscrapers and beautiful lakefront as you're coming up the path. Our first rest stop will be at DuSable Harbor in downtown Chicago located directly off the Lakefront Bike Path. Located in the heart of downtown at the foot of Randolph Street, the harbor is surrounded by Chicago's towering skyline! From the end of the lakefront path we will travel along very low traveled residential streets through Chicago's north side, riding past many of Chicago's famous "bungalow" style houses. Then you will then bike to our next rest stop in Skokie on the North Shore Channel Trail, which follows the North Shore Channel canal. Running alongside almost the entire length of the trail is the Skokie Northshore Sculpture Park which contains over sixty large scale contemporary sculptures on exhibit. 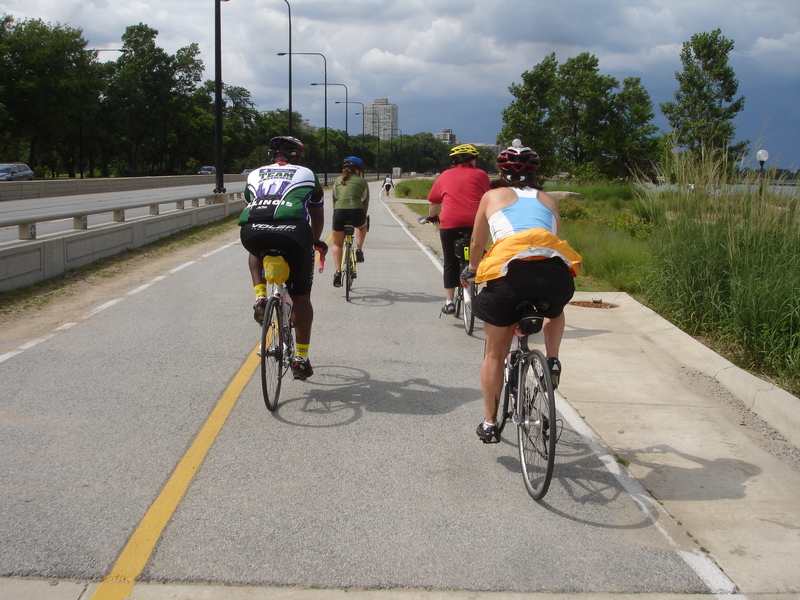 From rest stop 2 in Skokie you will bike to the start of the Green Bay Trail in Wilmette. The Green Bay Trail parallels the current Metra North Line and is directly on the track bed that once used was for the Chicago North Shore and Milwaukee Railroad, a train service that stopped running more than 50 years ago. Make sure to keep your eyes open for the remnants of the concrete bases of the old stations, especially in Winnetka and Glencoe! From the Green Bay trail, you will bike to the start of the Robert McClory Path in Glencoe which you will follow is almost a direct route to rest stop 3 in Lake Forest. Along the way you will bike through the famous Ravinia festival in Highland Park and directly past Fort Sheridan in Highwood, a former major United States Army post officially closed by the Army in 1993. In case you are unable to finish the ride, you can easily take a Metra Train back into downtown Chicago from rest stops 3 and 4. Bicycles are allowed on the train, subject to restrictions. Click Here for more information about Return Metra Train Service. Out of rest stop 3, you will continue following the Robert McClory Path immediately past the Great Lakes Naval Station, home of the United States Navy's only boot camp and the largest training station in the Navy. Rest stop 4 is directly at Waukegan Harbor. Going into and coming out of rest stop 4 there are some very steep hills so get ready for a good challenge climbing them! Our rest stop is in a perfect scenic location and we know the cool breeze off the lake will feel great! In addition, there is also an ice cream stand, hot dog stand, and deli directly at the rest stop so make sure to bring some cash with you and enjoy an ice cold ice cream cone on a hot summer day! The Waukegan Metra station is only two blocks from rest stop 4 and you can either choose to end your ride there and take the Metra train back into Chicago or ride up to Kenosha and back to rest stop 4 if you don't want to take our return transportation service. Fully assembled bicycles are allowed on the train, subject to restrictions. About three miles after rest stop 4, the Robert McClory Trail continues with a crushed limestone surface through the remainder of Illinois. You will have the option of either following this path for over eight straight miles across the state line into Wisconsin or continuing on a fully paved on road option primarily following residential streets. At the Illinois/Wisconsin state line the path becomes paved and all participants cyclists will follow it again. After you cross into Wisconsin the route will turn east for about two miles then turn back north. Here you will be able to ride directly along the shores of Lake Michigan as the route makes its way to our ending location through downtown Kenosha. Our ending location in Kenosha will be near the heart of downtown Kenosha at Eichelman Park right to Lake Michigan! There is a beach is right at our ending location and you can jump into the lake to cool off and refresh yourself from the long ride that day! Our	ending location is also very close to downtown Kenosha and there will be TONS of places for you to get some food or drinks at local establishments while you are waiting for our return transportation service from Kenosha. Both century options will begin at the ending location in Kenosha. After you arrive at the ending location, you can replenish yourself with snacks and sports drinks before departing to ride either century option. If you want to get in a century ride and will ultimately be departing from Kenosha, our century loop will be a counterclockwise loop route that begins and ends at the ending location. You will head north for just over two miles directly along the Lake Michigan shoreline, then head west and back south to the end of the bike path from Illinois. From there you will head back east again and ride the same route you already rode, back up directly along the Lake Michigan shore back into the ending location. It's like getting a Lake Michigan two for one deal! If you want to get in a century ride and will be departing from Waukegan, you will turn around from the ending location and ride the exact same route back to rest stop 4 in order to catch the Metra train back from there.